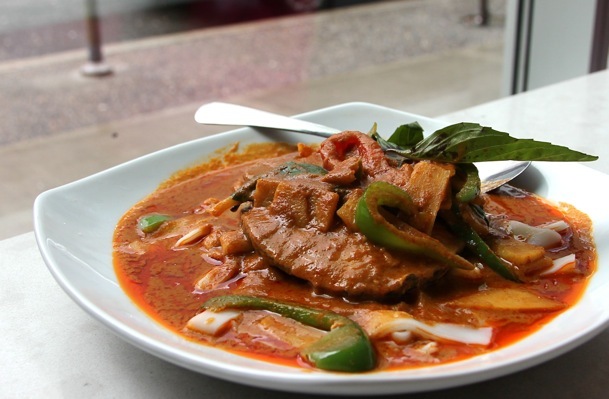 Looking for Thai food in downtown Vancouver? You found it. Hot pink seating, white Chihuly-esque chandeliers, and lofty ceilings. Alberni Street’s new ultra-modern Thai restaurant had me feeling as though I were in Miami. Pink Elephant, boasting an 88-seat dining room, is the Thai House Restaurant Group’s sixth concept. An endearing welcome, including a ‘thank you for coming’ bow, kicked off the lunch. My small Pellegrino bottle arrived in an ice-filled carafe, further hinting at good service ahead. A small, fragrant bowl of Hot and Sour Soup ($5) arrived within five minutes of ordering. The Keang Dang Curry ($12) —an ideal meal for hasty diners — came shortly afterwards. Two centimeter-thick slabs of skin-on black cod — topping an awfully soft bed of noodly rice rolls —swam in a heavy, spicy red curry with green peppers and bamboo. The menu is lengthy and the food reminiscent of other Thai House Restaurant Group’s eateries. If you have a craving, Pink Elephant can do the trick.